Home / Freebies / Enter to win $1,000 from Learnvest! 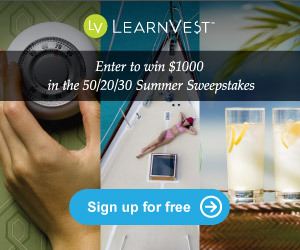 Find out how you can Enter to win $1,000 from Learnvest in their 50/20/30 Sweepstakes! Learnvest is interested to know how you divvy up your paycheck. They have developed the 50/20/30 rule to help you make the most of your paycheck. They also want to give away some money! One lucky winner will get $500 to go towards essentials like your A/C bill in the summer, $200 for a savings goal and $300 for lifestyle choices such as going out for dinner or your yoga classes. Just sign up for a FREE LearnVest account today and you will be automatically entered to win the $1,000! By signing up you will also get access to free money tips, tools and advice to help you get organized and be in control of your money. Who couldn’t use a little money advice? ?